After two weeks of 6-team byes, the teams not playing this week are finally fewer in Week 11. That’s also a good indicator we are headed into the stretch run of the fantasy football season. No better time to get some advice. During episode number 22 of Prime Time Fantasy Football Adam Gori, Joe Webster and I all talk about everything fantasy-relevant heading into Week 11. High/Low is back and better than ever. Well it’s pretty much the same structure-wise, but it’s always good when we hit on a lot of predictions like we did last week. Listen and listen good, because this week Andre Ellington, Ryan Mathews, Brandon LaFell and Martavis Bryant are all on someone’s list somewhere. We’ll also discuss two boarderline QB1s in Russell Wilson and Matt Ryan. That segment is followed by another great interview with another great source. 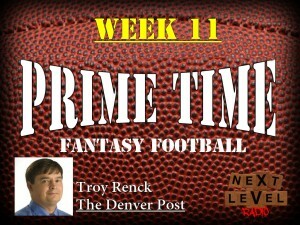 Troy Renck from The Denver Post joins us for 15 minutes to talk about the Broncos’ running situation, receiver situation and defense. We even got in some Brock Osweiler talk. Compelling stuff. We also continue with our weekly “Zero to Hero” and “Don’t Buy the Hype” segments. See which wide receivers, quarterbacks and running backs will have a bounce back week and which will take a step back in Week 11. Then we close the show with a “Droppables” segment. With the byes slowing down its time to start looking for some players that will benefit you down the stretch. So what we do here is give you six guys who are over 50% owned but you can drop and six guys who are under 50% owned but you should pick up for the final weeks of the season. You’re welcome.